OSAT Blog Hop – Spring has Sprung! Home / Blog / OSAT Blog Hop – Spring has Sprung! I had a lovely two days in Manhattan! My time at The Ink Pad was fun as it always is, I of course picked up some more goodies! LOL! It’s rough sitting there looking at all of the awesome things that they have without leaving with something! I want to thank my amazing friend Kim for her hospitality as always and I look forward to seeing her again on Friday! She’ll be at Card Class and then I’ll be squatting at her place yet again! She really is just the best! Today I’m off to see my friend Sue for Etsy fun and then it’s IKEA and Thirsty Thursday with Heather and the gang later on! For my projects today I’m participating in a blog hop with a bunch of my friends from one of the Facebook groups that I belong to. 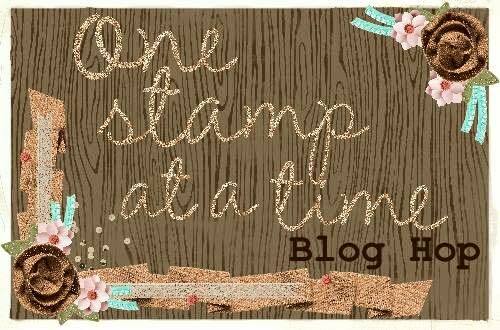 It’s called One Stamp at a Time Cards and More. This month we have a Spring is Sprung theme! It’s quite timely for here in NY, it was 76 degrees yesterday!! 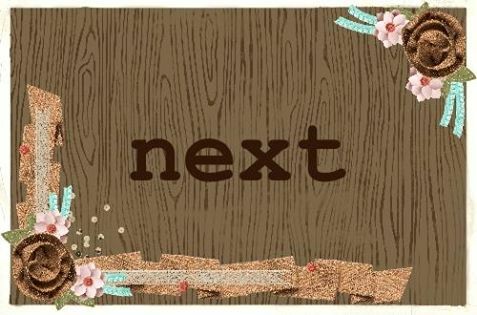 If you have arrived here from Megan’s blog welcome! Isn’t she clever?! I have a card and a little terrarium for you today so let’s get to it! First up is my card and that starts off with a base of Neenah Solar White 110lb Card Stock. I covered the front in a piece of Lawn Fawn Mermaid Card Stock that I cut out with the Lawn Fawn Stitched Rectangles Lawn Cuts. I used the same size Stitched Rectangles to cut out a piece of Noble Fir and Solar White 80lb. On the Noble Fir I used the Lawn Fawn Grassy Border Lawn Cut and on the Solar White I used the Puffy Clouds Border Lawn Cuts. I also cut out a piece of Solar White with the Picket Fence Border Lawn Cut.. The fence and grass are adhered with Multi-Matte Medium and the clouds with E-Z Runner. I stamped some images from the Lawn Fawn Fairy Friends and Gleeful Gardens Photopolymer Stamp Sets in Memento Tuxedo Black and colored them in with my Copics. They are cut out with the Coordinating Lawn Cuts and all are adhered to the card with E-Z Runner with the exception of the fairy who is adhered with Foam Tape. The greeting is stamped on the clouds with Onyx Black and some Pretty Pink Posh Amethyst and Sparkling Clear Sequins are added to make it look like the fairy is sparkling some happiness on the greenery! I have to say that I’m really liking the Lawn Fawn Card Stock, nice bright and bold colors with a good weight to it and the fun spring scene is just fun! Next I have my little terrarium! I was inspired by the ones that I saw on the Lawn Fawn Blog a few weeks ago! All of the images are from the Fairy Friends and Gleeful Gardens Photopolymer Stamp Sets, again colored in with my Copics and cut out with the Coordinating Lawn Cuts. I took a styrofoam ball and trimmed off a piece and then wrapped it in some Green Felt adhering it with a Hot Glue Gun. I always forget how hot the glue is until I’m reminded by it sticking to my finger and giving me a nice blister! The pain we endure for crafting! LOL! The “grass” is then adhered to the lid with more hot glue. I used Floral Wire adhered to the backs of the images to attach them to my “grass” and then screwed the lid closed. I think it’s a really cute piece of decor and will look neat on my kitchen table! This entry was posted in Blog, Cards, Copic, Crafts, Embellishments, Lawn Fawn, OSAT Blog Tour, Photopolymer, Pretty Pink Posh, Stamps and tagged Card Making, Crafts, Lawn Fawn, OSAT Blog Tour. Bookmark the permalink. Love the fairy sprinkling fairy dust sequins across your scene. So, so cute Justin! 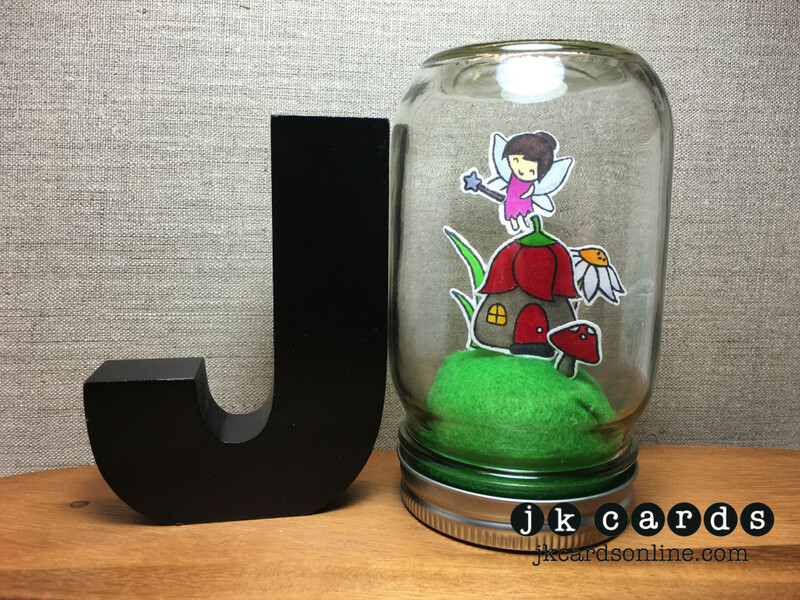 I saw a sample of one of these jar scenes on the Michael’s blog but it wasn’t anywhere near as cute as yours. What a fun class project that would be. You really did do a fantastic job coloring in all your images. I bet your Mom would love one of those jars filled with a flower scene for Mother’s Day. I know I would. What the heck is going on. The letter i seems to disappear from all the responses. I know it was there before I pressed the post area. That is just too wierd! Really Grace? Hmm… that is odd! Thank you Grace! I think that the ones that I saw on the Lawn Fawn blog were awesome so I had to give one a try! It would be a great class project, but it would have to be the only one! It took a while! I think that they would make excellent Mother’s day gifts! Thanks for the idea! How cute is this? What a great gift set… love it! OMG! i was just telling Andrea that I want this set so badly! I love your fairy garden and your beautiful card! Another masterpiece! Adorable projects! A great way yo capture “Spring in a Jar”!! You always have such amazing projects. That terrarium is just too cute! That gives me some ideas. Thanks Justin! Really cute projects today , Justin. I love the card and, of course, the terrarium is especially cute. Have a great weekend. Our weather has been gorgeous for a few days. I don’t think it will last until May, but we’re enjoying it now. 76? Unfair! But I’ll take my upper 60s and the spring smells. OMG the terrarum is too clever. 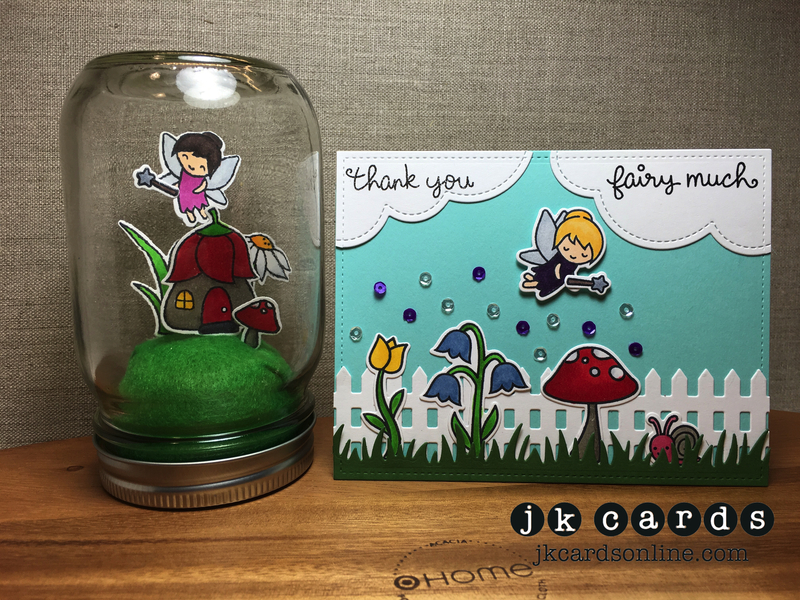 Super cute card and terrarium! Love the Copic coloring you did. Super cute card and terrarium! Love the Copic coloring you did. Wow….what happened to the typing in my other comment, lol! So cute! I need to try one of those terrariums! Oh my goodness that is so… cute. The little snail might be my favorite! The fairies are soooo cute – thanks for sharing your talent!